For many of us, our credit score is the number that we didn’t even know we needed to manage, until it’s too late. We wait helplessly as lenders pull our credit history to determine where to set the interest rate on our loan. Bad credit can hurt our future finances by increasing interest rates on credit cards and mortgages, a frustrating cycle that can result from too much debt, a spotty payment history, credit cards that have unpaid balances, and even student loans. The concept of a credit score was introduced as an effort to take bias out of lending. Before credit scores, lenders made character-based decisions. Stores and banks would determine which individuals they deemed worthy of credit. This system resulted in discrimination against women and people of color, who were often deemed risky (and therefore unworthy of credit) against the highly subjective standards of the day. Statisticians Bill Fair and Earl Isaac worked to create a more objective, mathematical model to assess creditworthiness. Their score, the FICO Score, was developed by Fair Isaac Corporation, and is now the most common method used to calculate your credit score. However, the score - first introduced in the 1950’s - wasn’t widely used until the 1970’s, when modern credit reform legislation started to even the playing field in regard to credit access. Today, credit scores range from a low of 300 to a high of 850. Generally, a score below 550 is considered bad, 550 - 649 is poor, 650 - 699 is fair, 700 - 749 is good, and a score above 750 is considered excellent. If your score falls in the “bad” or “poor” categories - below 650 - you may have difficulty accessing credit, and may be charged very, very high interest rates. Similarly, if you are above 700 in the “good” or “excellent” categories, lenders will be very eager to do business with you. There are other scores like the VantageScore, but they tend to be used less often and are generally in line with your FICO score. 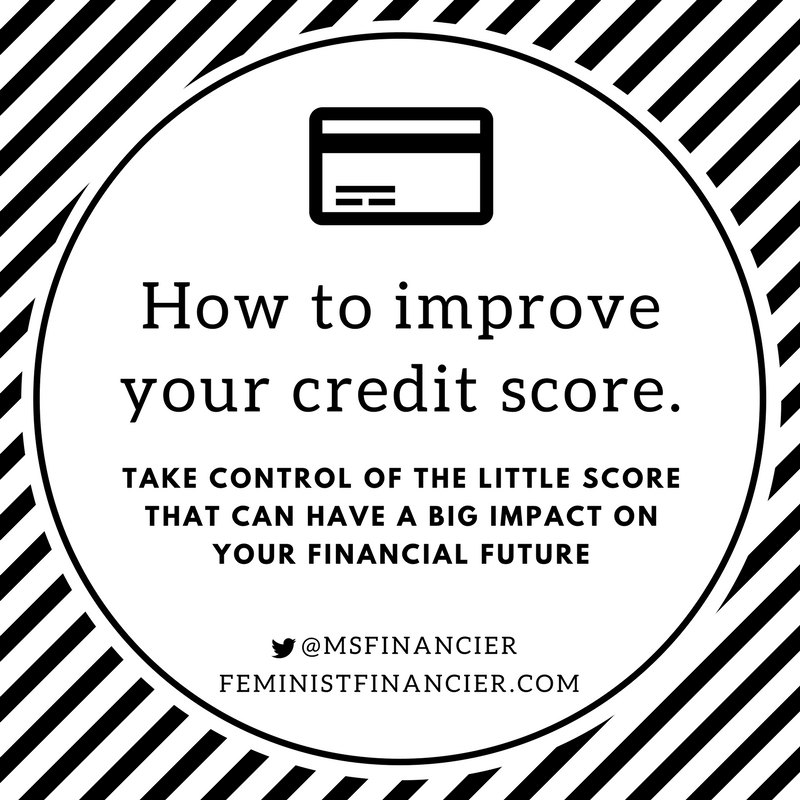 I recommend focusing on your FICO score as your primary measure, though you may also want to access other scores if you have the time to do so. So, what should you do if your score is lower than you’d like? Follow my step-by-step guide below to start improving your credit score. Know your score. First, you need to know your score. You can pay for your score via the three major credit bureaus. When accessing your score, be careful to avoid ongoing “credit monitoring” offers - these offers are often served up to you automatically when you are pulling your score. As you check out, ensure that you’re only paying to pull your score, and not signing up for repeat charges. If your score is lower than the “good” or “excellent” categories, you may consider prioritizing areas for improvement. Pull your credit report. Your credit report includes the data that contributes to your score, so ensure that you have a recent copy of your report to help you analyze your score. While legislation in the U.S. allows you to pull a free credit report each year, credit scores are not included in that free report; ensure you have both. When you pull your credit report, look at it carefully for errors. Credit reports include a lot of data on your credit history, reported by banks and landlords, and can contain mistakes. Ensure that addresses are correct, that the accounts listed are owned by you (or were yours in the past), and that any late payments were, indeed, paid late. Each credit bureau has a specific process to fix any errors on your credit report, so if you find an error, take notes of exactly what you’ve done to work with the reporting agency to fix the error. Unfortunately, consumers (and not the agencies) bear the burden of putting in the work to fix mistakes. Follow up until you are absolutely certain that the error has been fixed. The type of credit in use refers to the diversity of your credit sources. Do you have five credit cards, but no other loans? This tends to lower scores. Or, do you have a student loan, one credit card, and mortgage? This mix may raise your score, as it demonstrates using credit for different things, with different loan structures, versus a reliance on one type of credit. This is a smaller portion of your score, so I do not recommend taking out more loans to improve your mix. You should limit your loans to what you truly need. However, if you have many types of the same credit (for example, many credit cards but no other loans) you may want to consider closing some cards. That said, any credit mix improvement will only have a modest impact on your score. New credit looks at the recency of your accounts. In general, if you don’t have much new credit, your score will be higher compared to someone who has recently opened up several new accounts. New accounts may signal that you are over-extending yourself or aren’t able to pay your debts, which can lower your score. You can’t take proactive steps to improve this element, but you can stop opening accounts to improve this portion of your credit score. Length of credit history is similarly something you have little control over. Generally, the best credit is old credit, and the factors in this category include how long your accounts have been open, how long since accounts have been used, and how long specific account types (like credit cards) have been open. Like the new credit factor, there is little you can do to improve this element, though you can take steps to keep older credit, as long as it isn’t too costly to do so. For example, you can pay off a high-interest credit card that you opened in college, stop actively using it, but keep it open to improve your length of credit history over time. Note that this may only make sense if the card doesn’t include any other fees or costs. If you’re new to credit, and don’t have credit cards or other loans, you may want to open one card and charge a single item on it monthly to start establishing your credit. Once a week, you can pay for your groceries on the card and immediately pay it off. I’ve struggled with credit card debt, so I understand why many avoid credit cards - but if you don’t have a credit history, it can be challenging for lenders to score your creditworthiness, and therefore you’ll end up with higher rates on things like auto and home loans in the future. Amounts owed, or credit utilization looks at how much you owe (your balance) relative to how much credit you have available. This is a large factor of your score (up to 30%) and - good news - one that you can take proactive steps to improve. Here, you can have a measurable impact on your score in a relatively short period of time. For example, if you lower how much you owe on “riskier” accounts like credit cards, your score will increase. FICO does not treat all debt the same, and mortgage, auto, and student loans don’t hurt your score in the same way that credit card debt does. This is because credit cards have a balance that you control - your choices each month determine how much credit you’ll use, and therefore how large your monthly bill will be. In contrast, an auto loan has a fixed structure. Your auto loan was provided out for a certain amount, and you paying on a set schedule each month. This is a less risky proposition for lenders, who like predictability. If you have credit cards with a balance, my recommendation to improve your credit utilization is to take out all of your credit cards, write down the balances you owe and the interest rate, and start paying off the highest interest rate cards first. This will save you money by lowering the interest you pay and eventually improve your credit score. Similarly, you can call each credit card and request a higher credit limit. An increased limit means that you will be using less of your available balance. However, it is important that you aren’t tempted to use your credit cards more to take advantage of your higher limit. If you keep your credit cards open when you pay them off, this can help your score (because you are using less of the total credit available to you). Again, this can be a balancing act with the first factor (type of credit in use) - but remember, that is a much smaller portion of your score, at only 10%. If you don’t have credit card debt, but have other debt (like student loans or auto loans), you can also work to reduce those balances. The amount of debt you have left on these loans is also a contributing factor to your credit utilization, and paying off your loans faster than expected can also help your credit score. Some auto, student, and home loans make it a little tricky to pay down your loan balance earlier. I recommend calling your lender to understand the preferred way to make extra payments, so they don’t accidentally apply it to your next month’s payment - which would help you next month, but would not lower your balance faster. Tell the lender you are interested in making an extra payment towards the principal balance of the loan, and then keep an eye on your next statement to ensure it was applied correctly. Payment history is the largest single factor in your credit score, at 35%. This element looks at how you’ve handled the credit you’ve been provided in the past, which FICO has found is a good predictor of future behavior. Payment history includes seven sub-components, including length of overdue accounts, amount of money in collections, and past due items. Negative items like bankruptcy or an unpaid account that went to collections can stay on your credit report for 7 - 10 years. Since this section includes historical information, there are limits to the proactive steps you can take to improve this section of your credit score. That said, you can take steps tomorrow that will improve your score in the future - these include prioritizing getting up-to-date on any accounts that you are behind on and checking your report for errors as I mentioned above. Managing your credit in the future. In addition to the steps above, you can take active steps to protect and manage your credit to it continues to improve in the future. Two of the most powerful steps you can take are only accessing credit when you critically need it and paying your balance on time. If you only access credit when you critically need it, you are less likely to be tempted to fall into debt and will have a cleaner, tidier credit report. Women are often tempted by store cards that are offered by retailers when we’re shopping - I urge you to avoid these, as they are some of the highest interest-rate cards on the market, and also increase the number of credit cards you need to manage. Twenty percent off your purchase isn’t worth increased debt and stress. Additionally, if you pay your balance on time, consistently, you are taking one of the best steps you can to improve your score. If you’re going to have trouble paying a bill, call your lender and work out an arrangement - many will accept a partial payment. Your lender reports missed payments to the credit bureaus, so you’ll want to work proactively with lenders to ensure they know your payment is coming, and don’t report a missed payment instead. Finally, you may want to consider freezing your credit. This is a simple, effective, step you can take for a modest fee (often $5 or $10, and in some states, it is free). If you freeze your credit, no one can open up any credit without your confirmation first. This is a powerful step to protect yourself from fraud, which can have devastating effects on your credit report and score. You can freeze your credit by contacting the three agencies directly. The last time I froze my credit I was able to complete the entire process for each agency online, in under thirty minutes. When you freeze your credit, you are given a PIN that you will unlock your credit should you need to apply for a loan in the future. Save this PIN in a safe place, and should you need a loan in the coming years, you simply contact the agencies and provide the PIN so the lender can pull your credit. Candidly, I recommend a credit freeze over credit monitoring, because a freeze is more preventative. Credit monitoring tells you if something looks incorrect, which means you may have already been a victim of fraud. Additionally, credit monitoring often involves expensive, monthly fees. I wish you the very best as you work to strengthen your credit! If you take steps now, you can move your credit score up, putting you in a more favorable position for your next loan, saving you a tremendous amount of money in the long run.